QUEBEC CITY (CNS) — Cars continued to arrive in the parking lot of St. Cecilia Church, an unusual sight on a chilly and gray Saturday morning. A bit hesitant, the occupants slowly gathered in the church. The crowd was mostly men and women in their 30s and 40s. Some were accompanied by children. Despite polite smiles and warm welcomes, the atmosphere was heavy. They all had something in common: mourning the loss of a baby. Few among the group were regular churchgoers. But for at least one morning, they participated in the feast of the angels, a liturgical celebration organized by the staff at St. Charles Borromeo Parish, of which St. Cecilia is one component, and Les Perseides, a lay organization that supports grieving parents who have lost a baby through miscarriage, stillbirth or perinatal death. The organization is named for the annual Perseid meteor shower, or shooting stars. The observance occurs once a year, usually around Oct. 15, designated as Infant Loss Remembrance Day in Canada and the United States. It’s the third year that the parish has hosted the service. Whether they have lost a child recently or a while back, the parents still carry a heavy heart. They gather to honor the memory of their child and reflect on the uphill road they have faced in their mourning. Sabrina Courant, Les Perseides president, welcomes the families with a warm handshake. She said she joined the organization so that her daughter, Myriam, can “keep on living.” Four years ago, Courant lost Myriam in the 41st week of pregnancy, two days before she was supposed to be delivered. “There’s no relation between the love and care you’ve put into your child and the number of weeks he has lived,” said Courant, a Catholic. Organizing the event takes time and much thought. “We have to find the proper tone and set up a formula that accommodates both steady churchgoers and nonbelieving mourners,” she said. Deacon Nadeau’s first contact with perinatal loss came when he prepared some couples for the baptism of their child. One day, a couple told him that they felt unable to go to church for the baptism, mentioning that they still felt guilty about an abortion they chose during a previous pregnancy. Many people live such tragedies and are left to cope on their own, Deacon Nadeau said. “One might say that the church has overlooked such realities. I’m not here to exclude anyone. Wherever and whenever that loss happened, come. Come, the Lord welcomes you as you are,” he said, taking his place in line for a silent procession. “I’ll never hear you say Mommy, Daddy. “Nor singing your first song. “Yet you were already living in my flesh. “I already had chosen your first name. “You, the child I longed so much. Tears flowed. Some parents buried their faces in their hands while being comforted by a relative or friend. The celebration continued with a testimonial from Sebastien Tremblay, a young father who said he never goes go to church except for the annual prayer service. Five years ago he and his wife lost their daughter, Melina, four days after she was born. “Those four days allowed us to get prepared, so that we may have the time to pack up our bags for the strenuous and long journey we were called to face, mourning our little one,” Tremblay said between frequent pauses to clear his throat. “We’re still crying,” he continued. “Yet, six years later, we try to focus of the happiness we experienced in those nine months and four days that we were together. We cherish the miracle of having known and having loved madly our little angel, before she vanished forever. “Even if our eyes are still red and swollen, we wish to wear a warm smile while waving our hands to her and telling her how much we still love her,” Tremblay concluded before returning to the pew where his wife and two young daughters sat. The girls never had the chance to meet their older sister. 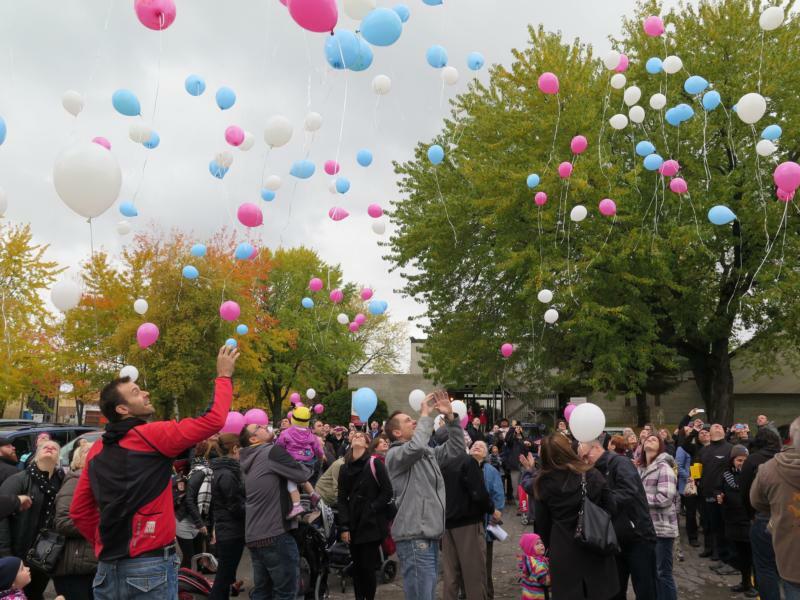 The celebration continued with symbolic gestures: the lighting of candles, the naming of deceased babies, the writing of messages on helium-filled white, pink and red balloons that were to be released outdoors. By the end, the heaviness had lifted and had become a joyous clamoring. The assembly moved outside to the parking lot where the balloons were released skyward. A crying couple hugged while watching the balloons swarm in the air. Not far away, a little girl asked her family where the balloons were going. “They’re going to Raphael’s party,” said the lady next to her.